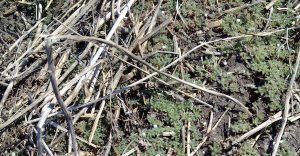 If target weeds for a pre-seed burnoff include kochia (pictured), tank mix glyphosate with carfentrazone, which works really well on kochia and prevents glyphosate-resistant kochia. 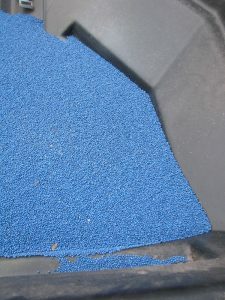 This week’s quiz has questions on pre-seed tank mixing. Are you are a grower who sprayed quinclorac on canola during the 2015 growing season and is now looking for a place to sell your grain? If so, be sure to ask your local elevator or processing facility if you can deliver to them, and if not, which elevators or facilities in your area may still take it. Dry soil: Seed now or wait? 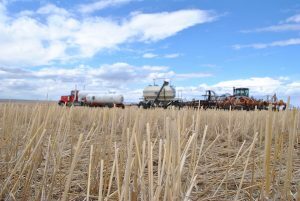 If the choice is to seed canola now into dry soil or wait until after it rains, seeding into dry soil is a workable option. 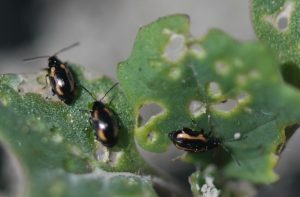 Warm weather has meant an earlier emergence of overwintering adult flea beetles. 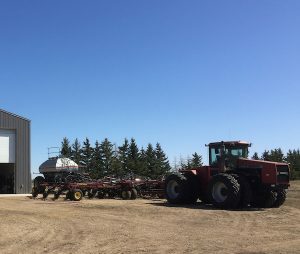 Given that flea beetles will be active when canola emerges, growers will want to pay attention in the few weeks after emergence to see how seed treatment protection holds up and whether additional sprays are warranted. canolaPALOOZA is a one-day extraordinary outdoor fun learning event. The best research and agronomy extension people come together in one place for a day of interactive in-field learning with growers, agronomists, retailers and others. Think canoLAB in the field — except at canolaPALOOZA you move through learning stations at your own pace. Dates are June 21 at the AAFC Crop Diversification Centre in Portage la Prairie, MB, and June 28 at the AAFC Research Station at Lacombe, AB. No.1 canola must have 90% germination or better at the time of sale. The seller is responsible to make sure seed complies with the grade on the tag. Growers can ask for the latest seed analysis when they pick up their seed.